Welcome to another installment of ‘Fellow Fibre Friends’! This week, we meet Jennifer Riester, who is a knitter and tech editor (ie, she edits knitting patterns.) You can find her on her blog, Jen Knittng Around. I have to say that I love that WordPress sends this out each year. It’s a great reminder that someone, somewhere is reading this blog! Thanks to all who stopped by and read, liked or commented! Back in the saddle this week – totally planned on doing a post last week but the week got away from me. Good news is that I did get in a fun, knitting-related adventure which I will touch on later. But, first, let’s talk about gift knitting because ’tis the season! I feel that there are several issues which will cause quite a debate if brought up on the company of knitters. One of those is definitely gift knitting so I thought I would share my thoughts on the subject this week. I’m a huge fan of gift knitting. I knit gifts every Christmas, and some years they become MLK Day gifts or Presidents’ Day gifts but that’s okay. I also do not take into account the person’s “knitworthiness” This is a term I’ve heard and seen thrown around with more frequency of late. And, I feel it makes us knitters sound very snobby about our knitting. No, I’m sorry, you’re not worthy of my knitting time. Maybe I’m just lucky and I feel that everyone in my life is knitworthy. But, I don’t think that’s it. I feel everyone deserves a hand knit gift. Now, don’t get me wrong, I’m not knitting everyone I know a pair of socks, or even a scarf but there are plenty of little knit items I’ve made as Christmas presents over the years. Years ago I read a book (can’t recall the title) and it was about using feng shui to clean your clutter. It had a lot of good things to say but the one that really stuck with me was that once you give a gift it’s the receiver’s and you have to (in Elsa’s words) let it go. In this case the author was talking to gift receivers and saying that even if it was a gift, if you are not using it, it does not fit or whatever the issue you are free to let it go. Just because it’s a gift is not reason to hold on to the item. I think of that when I’m giving a gift as well. Maybe the person won’t know how long it took me to knit the item and maybe they won’t like it but that’s not really the point. Maybe it ends up at their Goodwill store – well, hopefully someone will buy who does really want it. I don’t normally knit for the same person year to year. And, sometimes, I like to surprise people with a hand knit gift. I’m not knitting it for their reaction but for my enjoyment of knitting and of gift giving. And, let’s face it – how many socks/shawls/scarves do we as knitters actually need? I’m going to knit all the time so I might as well share the joy of a handmade items with others in my life. Sorry for the poor picture quality but these were all taken pre-blog and before I started working on my photography skills. These are all gifts I’ve made in past as gifts for Christmas. I would say that of the 4 I have no idea what happened to 3 of them. I can tell you that the angel in the bottom corner was eaten by mice in my friend’s attic. I will also say that my friend was so upset about it that I knit her another one. Status of the replacement angel is unknown. None of these (well, maybe the angel) took much time and I have no idea if the person who received them really liked them or not. I was not even present when the wine or the stockings were opened. So, where do you stand on gift knitting? I hope if you are gift knitting that it is all going well 🙂 More on last weekend’s knitting adventure next week but now I have some knitting to get to! I think I have a record number of FO’s this month. Unfortunately many of them are Christmas gifts and some of the receivers might actually read this blog so I’ll just show some hints and will post full pictures post Christmas. Let’s start at the beginning. A third mermaid blanket. This completed an order for two from a friend. I think they will look super cute on Christmas! Moving on, while I was writing last week’s post I came across a super cute little ornament pattern that I had to make up for someone on my list. More on this later but here is a sneak peak! Also on the Christmas gift list – another sneak peak! And, last but not least – from this month’s on the needles post – the infamous TCU hat. Once I got going on this it actually knit up quite quick and I think it turned out great! I don’t do much colorwork but there is still quite a bit of give in the hat so my floats were not too tight – yea!! That makes 4 (or actually 5 – I made two of the striped project) FO’s for November. More exciting, and what I’m calling the Thanksgiving Miracle of 2015, I’m finished with all the Christmas knitting!!!! I’m going to spend December working on a few “extra” Christmas projects for those little things that pop up. I mentioned the ornaments on HandsOccupied site and she’s really been sharing some cute patterns. And, I’m going to join The Grinchalong which is hosted by the Knitmore Girls. 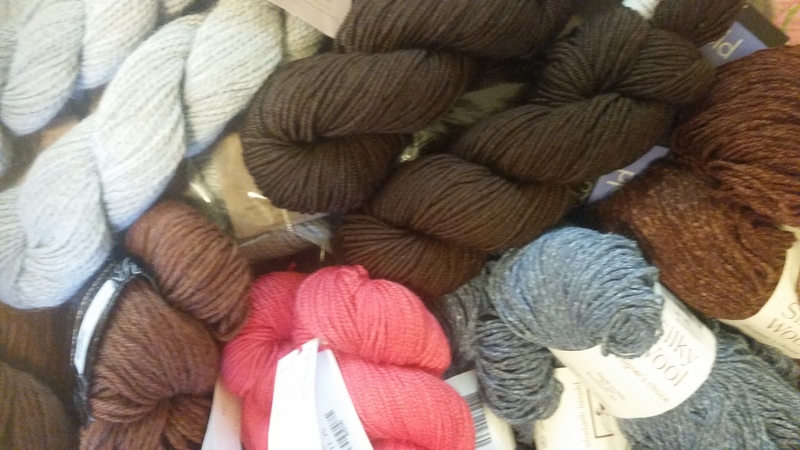 I had a moment of weakness and ordered some Christmas yarn from Voolenvine Yarns on Wednesday. I think I’m going to cast on the Verdure Shawlette by Fluffy Fibers and no pressure, maybe by next Christmas I’ll have a cute new shawlette to wear! Allow me to digress for a few moments and on this Black Friday here in the States share some words to think about as you head out into the crazy crowds. As I’ve hinted here and there it’s been a year of change for me. Part of that change involved losing the only job I’ve had as a “real” adult. It was not a job I loved or even liked so it wasn’t the worst thing that could happen. I was lucky and found something else to do right away but was still in a bit of panic about the financial end of things. (Side note – I’m pretty sure in a past life I lived through the Great Depression which explains my never-ending financial panic). I decided it was a good idea to get a second job as a cashier. It’s what I did all through high school and college and I’ve always loved grocery stores. I lasted about two months and Sunday was my last day but the two months reminded me of so much. I want to share a few tips that you can keep in mind next time you are at the grocery store, or any other store. Your cashier is a person too – treat him/her that way. You would be amazed by the varied backgrounds the people I worked with had. Heck, your cashier might even be a burnt out attorney, you never know! Either way, he/she is not below you in any way, shape or manner. In fact he/she is probably putting a harder day’s work in then you would ever imagine. I got a full body work out every night I went into work. 12 items or less means 12 items or less. Don’t try to pretend you didn’t know or could not count. (Best explanation I got for this – “maybe she was using common core math”) If you’re close, go to a regular line. You’re not only putting the cashier in an awkward position you are being rude to your fellow customers. When you use the baskets – empty them! Do you think they empty themselves??? They don’t and most cashiers cannot put them in front of them because that is where the scanner is which forces them to lean and stretch and you often have heavy things in the bottom which only increases the chances of a work related injury. Remember the cashier is the messenger in most situations. When you’re item does not ring up correctly it’s not because the cashier was personally trying to overcharge you. Screaming at him/her will not help the situation. Try to remember some basic manners. Coming through the line munching away on the food you are buying is a bit rude. If you’re kid needs a snack halfway through the store I get it but you’re an adult, I think you can wait until you’re through the line. Likewise, handing me the empty container of food to be thrown away it kind of awful as well. Want to really drive your cashier crazy?? When an item doesn’t scan ask him/her if it’s free. Seriously, if I had a nickel for every time I heard this in the past two months I could’ve quit a lot sooner. It’s not funny and we hear it all the time. And, if it’s not scanning we’re probably a little stressed anyway so you’re joke is not helping. And last, but definitely not least, PUT YOUR PHONE AWAY!!! I loved that one of my friends who is not a cashier did a post on this recently. Talking on the phone while you are trying to check out is rude and it often holds up the line because you are paying no attention to what is going on in front of you. Likewise, texting, updating Facebook or whatever you are doing can wait until you are done paying. True story – a woman came through my line one night and was discussing whether or not someone was going to stay on a ventilator. Probably not the right time/place to be having that discussion. So, as you do your holiday shopping keep in mind that cashiers are people too and during the holiday season they are probably way overworked and way underpaid so use your manners and be nice! Here are a few other alternatives to the craziness that is Black Friday. Remember that Saturday is Small Business Saturday – visit your favorite local stores (I’m sure we all “need” something at our LYS) Or check out a local holiday market and support local crafters. In Cleveland, check out the Cleveland Bazaar events here! First, my apologies to everyone out there – I’m really behind on blog reading and that has a lot to do with some other stuff going on right now so if I have not popped over to your blog recently I’m hoping to catch up soon and I miss seeing what everyone is up to! And, now, on with the 3rd annual rummage sale post. You can check the archives for the past two rummage sale posts but if you’re new to the blog know that I hate, in fact, loathe the annual rummage sale my church youth group holds each June. The only redeeming factor is that it usually provides material for a good blog post! This year, due to the aforementioned other stuff, I have escaped the torture that is working the rummage sale. I did get the opportunity to stop up one night after work as I had friends who were first time donors to the sale so I went up with them. I had heard that they had pulled aside the inevitable bag of yarn that had been dropped off so I knew I could check that out. There were actually three bags and they were stacked like a tower of discarded stash. The top bag was filled with less than desirable yarn, as was the second. Apparently, I wasn’t going to luck out like last year and find a bag of Zealana Tui – lightning doesn’t strike twice. I was not overly hopeful as I dragged the final bag out, but, JACKPOT!!! The complete inventory includes: 15 skeins of Silky Wool in Coffee Bean and 5 skeins of Silky Wool in Hazy Blue; 10 skeins of Blue Sky Alpaca (sport weight) in a natural color; 2 skeins of Cascade 220 in a brown color; 13 skeins of Berrocco Inca Gold in a very dark brown and 2 skeins of Shibui in Watermelon. 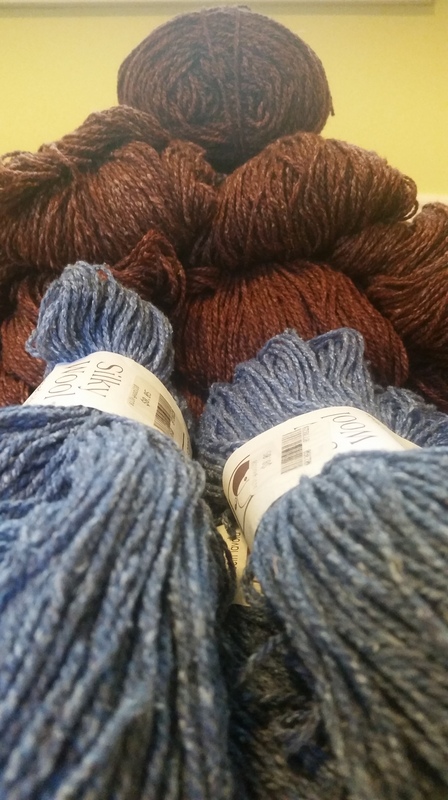 I’m super excited about the Shibui and the Blue Sky Alpaca! The blue Silky Wool will probably going to one of my knitting friends because that is really her color and we’ll see about the rest!